Text : Ashok Parimoo | Photographs : Guruduth kamath. 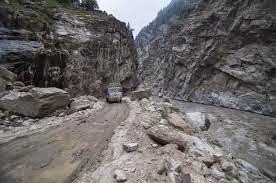 After experiencing driving on NH-22, Myself (Ashok Parimoo) and Guruduth Kamath advice to all tourists driving on HN-22, is that during rainy season, if possible, avoid NH-22 (especially from RAMPUR town right up to GRAMPOO village via KUNZUM LA pass). It’s one of the most nightmarish, treacherous and dangerous road that is loaded with abundance of unexpected disastrous calamities like sudden Cloud Bursts, sudden flash floods caused by sudden swelling “Nalas”, rumbling dreadful landslides, gurgling mudslides, shooting boulders and sudden caving in of road edges that causes parts of the road getting washed off, which leads to getting stranded for hours or for days all together. Throughout, this deplorably disastrous road also gets thickly coated with more than two feet thick sticky mud-slush, which easily gets glued to vehicle tyres that causes vehicles to skid and lose control of driving that can cause fatal accidents. So, our conclusion to all the tourists travelling on NH-22 is that while driving during rainy season, be aware, you too may be playing “Hide and Seek” with your “Life and Death”. So, if possible avoid driving on “Hindustan-Tiber Road” during rainy season. The “Rhymes of Mythology” Chants and “Harsh History” Whispers. 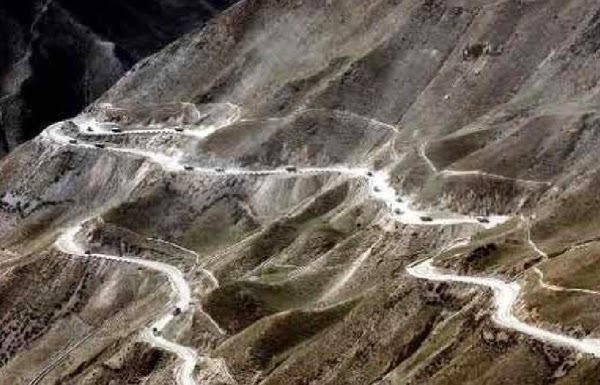 Not too long ago, a section of the “Trans Himalayan Hindustan-Tibet Road” was featured in the “HISTORY CHANNEL” as one of the most “Deadliest Road” series for its hazardous driving conditions in the World. 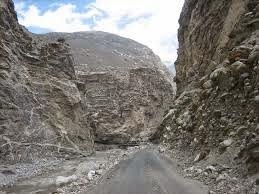 Since its reputation, it was one of my wild adventurous dreams that someday I must drive through this disastrously treacherous “Trans Himalayan Hindustan-Tibet” Road. 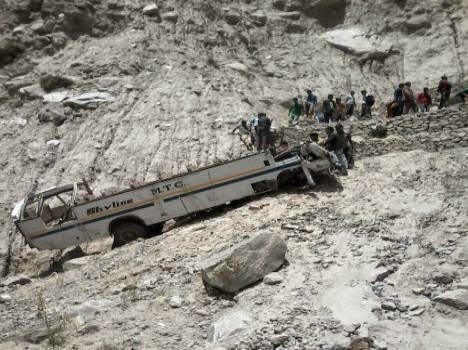 One of the most hazardously adventurous and treacherously disastrous motor-able terrain from “SANGALA” to “KAZA” and then from “SPITI TO LEH” is an utmost, enchanting endurance test of machine, man and his sprits. 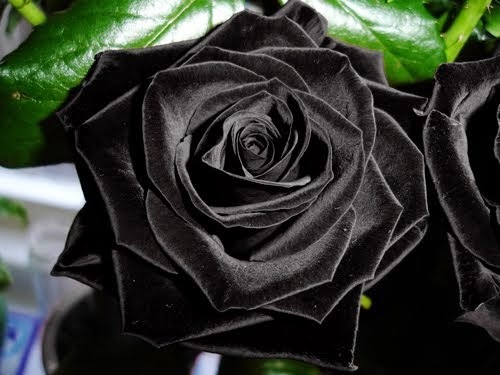 Because; this formidable high altitude’s most deplorable ‘Road Rage” is so hazardously treacherous, disastrously merciless, breathless and climatically the most un-predictive that even the most experienced motorist plays “Hide and Seek” with his “Life and Death”. But at the same time, the thought of braving this formidable dangerous terrain, the world has ever offered, definitely pumps more adrenalin into the thrills of the “Dare Devil Adventurer’s Mind, Body and Soul”. Sine earlier on my “Bullet Royal Enfield” Motor-Biker, I (Ashok Parimoo) have had traveled to Leh,four times. 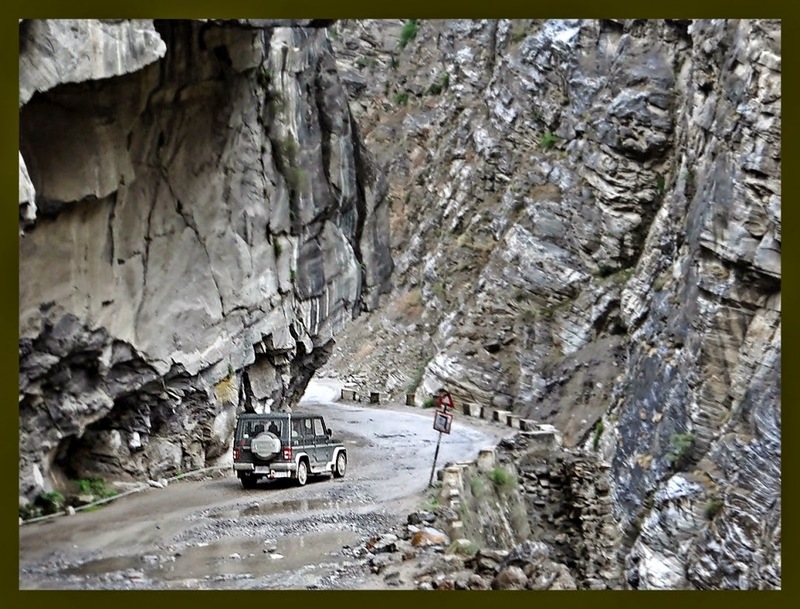 Twice from Kulu, Manali, Rohtang to Leh and twice from Jammu, Srinagar to Leh. 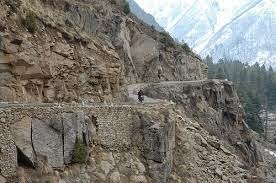 But the experience of driving on “Hindustan-Tibet” road is extra ordinary stressfully mind boggling. It was June 30th, 2014, at Guruduth Kamath’s Udupi (Karnataka) office, over a cup of Piping- Hot, “Ginger, Mint and Lemon, Green Tea” We both (Guruduth kamath & Ashok Parimoo), decided that we together should travel through this hazardously formidable route. Principally the basic thumb rule of touring and exploring these terrain together is that all the participants of the tour mates should have very good understanding of each other decisions taking capabilities, likes and dislikes. Otherwise the tour is going to be a total unpleasant fiasco. Since we both, Guruduth and I make a good team. 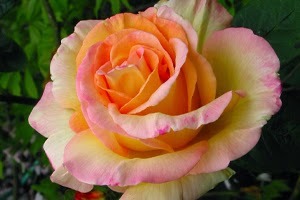 We very well understand each other’s likes and dislikes and decision taking judgments. Guruduth has an excellent photographic talent and I have an excellent talent of patience, No one hurries anyone. 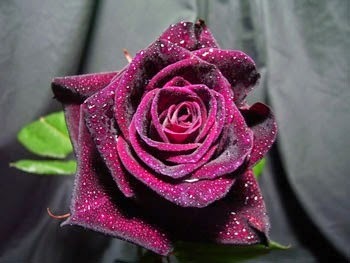 They say that sometimes, if anything impossible has to happen, it just happens within a fraction of time. Ours this situation too was exactly the same. This chilling and thrilling escapade of our Hindustan-Tibet road had not ever been planned or discussed with each other, earlier. It just happened over a cup of Piping Hot “Ginger, Mint and Lemon Green Tea”. So we both chalked out our tentative itinerary. We decided that on 15th of July 2014, we both would be meeting at Chandigarh. Since till 14th July, I would be busy at Jammu, so on 15th July 2014, I drove down from Jammu to Chandigarh (nearly 480 Km) and on the same date Guruduth reached Chandigarh from Udupi by train. I thought that if we hire any private taxi or travel by any public transport. The drivers of the taxis or that of the public transports would not obey or oblige at every beck and call of Guruduth’s to stop the vehicle for the picture shoot. So I decided to drive down my own brand new “Maruti Suzuki ALTO”. Though I knew that my “ALTO” would be a small tinny “FLUTTERING MOSQUITO” in front of those huge gigantic untamed rugged mountainous terrains, which are full of hazardous landslides, high altitude treacherous roads, un-predictive ferocious river crossings called as “NALAS”. But then this tempting dare devil instinct of Guruduth Kamath and mine (Ashok Parimoo) decided to accomplish and achieve our lives one of the most memorable dangerous and adventurous expedition escapade.. Mind you, at Khardungala to scale the highest hazardous motor-able road (18,500 ft) in the world was one of the most memorable experience of our life time. The British Governor General of India, Lord Dalhousie (1848-1856) was the one who introduced India to its first railway, laid out its first telegraph line, established its postal system and started the Public Works Department. Amidst all this reformation, he anointed Shimla as the Summer Capital of the East India Company. 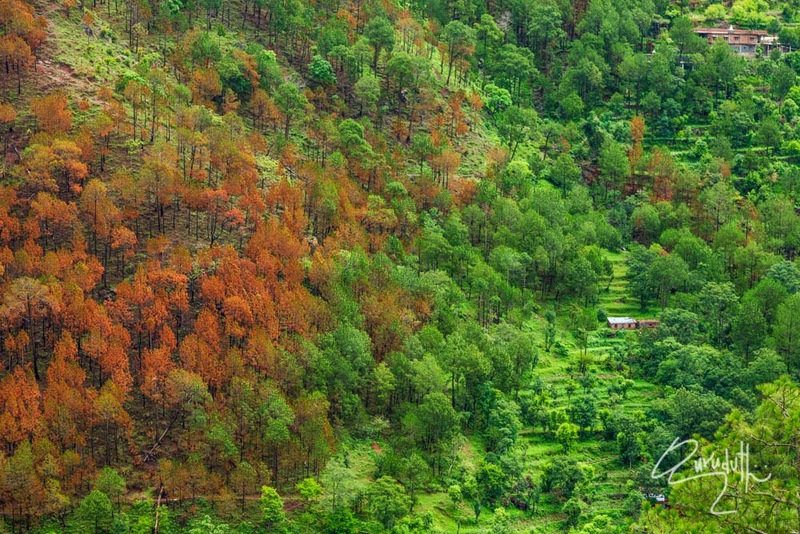 Not much later at Shimla, thwarted by climate, induced ill-health. He was forced to move his camp to “CHINI” (the present-day Kalpa in Kinnaur), upstream of the River Sutlej. The dry weather of “CHINI” and possibly the unmatched view of the “Kinner Kailash” made him to set up camp at “CHINI” that was mere forty-six mail hours or four marching days away from the Summer Capital “Shimla”. The British Governor General of India, Lord Dalhousie wanted to create trade ties with Tibet. So he ordered then Commander-in-chief Sir Charles Napier to commission the work of constructing Hindustan Tibet Road in June 1850 through one of the most deadliest region dubbed by awestruck 19th century travellers as the “THE VALLEY OF SHADOW OF DEATH” Then Commander-in-chief Sir Charles Napier designed the road map and immense machinery at the disposal of the East India Company was pressed into service and halfway down the nineteenth century, work on what was then styled as the “Great Hindustan Tibet Road” began. At initial stage, those days It was a small cut bridle path, meant for Traders on foot, Ponies and Mules only. 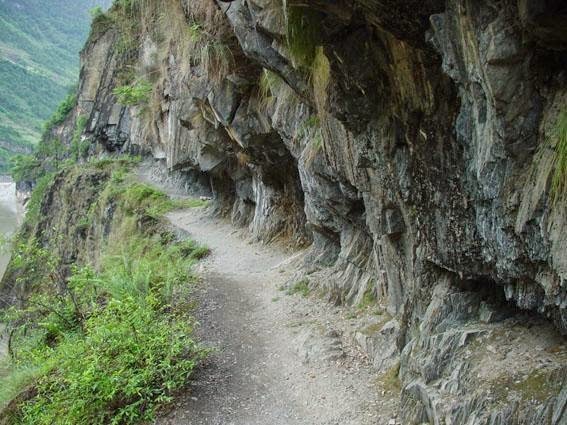 The Bridle path was not more that 4 to 6 feet in width. It would zigzag through “THEOG”, “NARKANDA” and “KOTGARH” to “RAMPUR”, across the “WANGTU” Bridge, to culminate at “CHINI”. Then at “SUMDO” village where the confluence of the Sutlej and Spiti rivers joins, an off-shoot on the right side of the road with steep ascends to “NAMGEA”, a small last village on Indian side. From there hardly a couple of hours run, the bridle road joins to the “(SHIPKI LA)” pass on the Tibetan border. 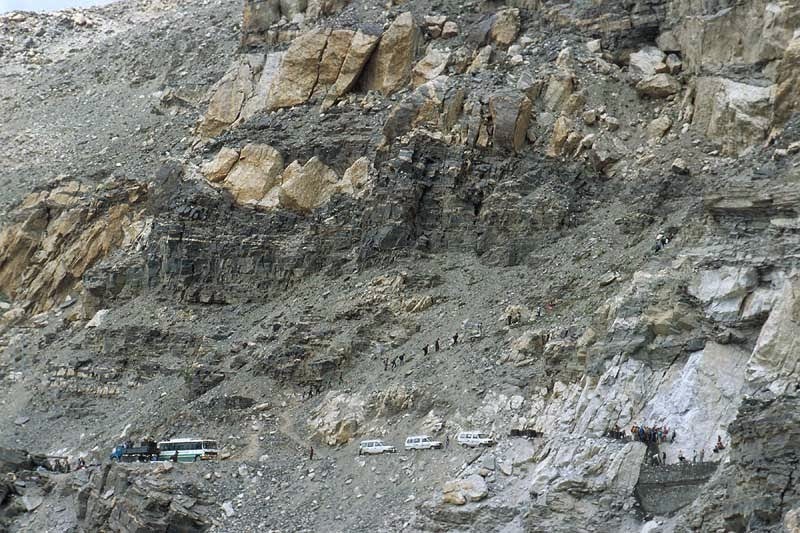 The route included a length of 228 miles through “(SHIPKI-LA)(” (16,000 feet) above MSL till “SHIPKI” village which is (14,583 feet) above MSL in Tibet. While the Dalhousie road brought the route into focus, the area had long been on one of the peripheral trade circuits of the legendary “Silk Route”. 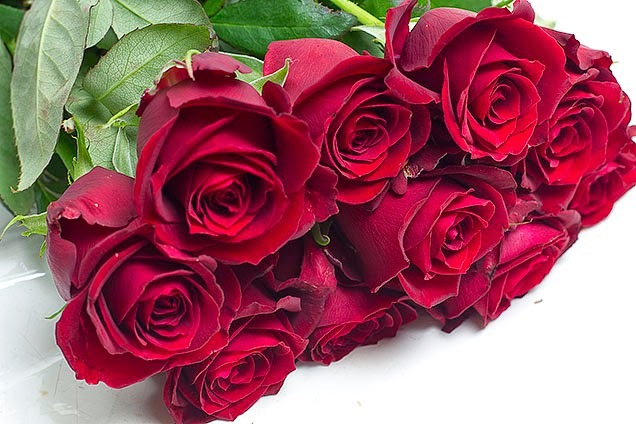 The path that passed the tract carried goods like musk, borax, wool, livestock, dry fruits, Salt bags, precious and semiprecious stones to and from “TIBET”, “KASHMIR”, “LADAKH” and “YARKAND”. 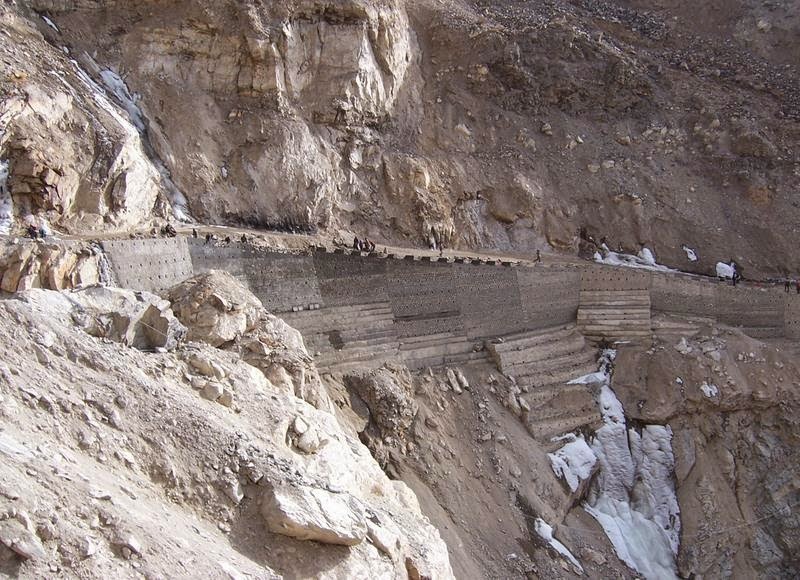 It was basically a Mules and Donkeys track constructed and maintained by British. Local traders used to do border trade through other passes also which were “(LUKMA-LA)” “(GONGMA-LA)”, “(YAMRANG-LA)”, “(GUMARANG-LA)”, “(SHIMDANG LA)”, “(RANISO-LA)”, “(KEOBARANG)” etc. 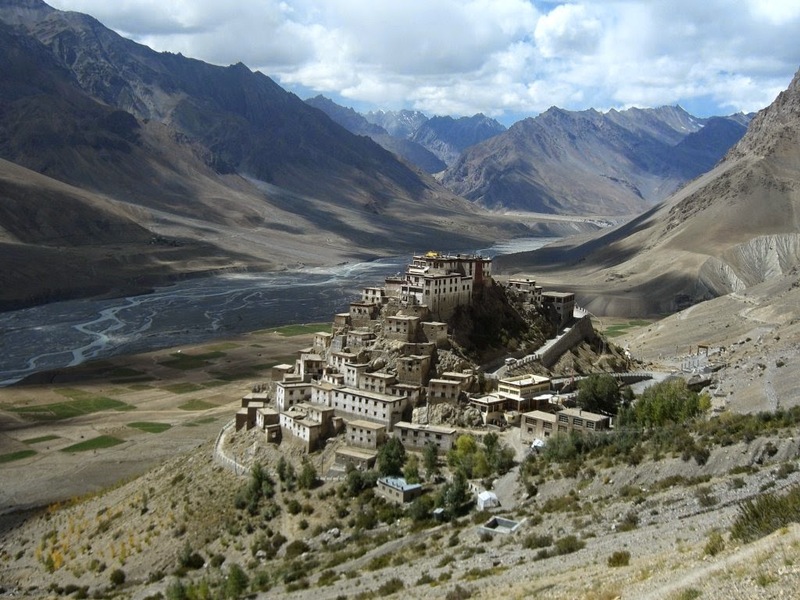 People of “BASPA” and near-by area used to go to “TIBET” through “(YAMRANG-LA)” and “(CHOR-GAD)” valley. Today, a newer broader NH22 has replaced the bridle path of Hindustan-Tibet road; essentially following the same route till “WANGTU”. 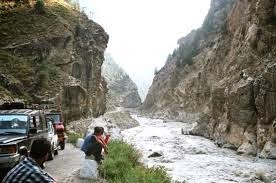 Here on the highway meanders along the left bank of the river “SUTLEJ” towards neighbouring “SPITI”. At “KHAB” (confluence of the SUTLEJ and SPITI rivers), an off-shoot ascends to “NAMGEA”, a couple of hours run from “(SHIPKI LA)” Pass and the India-Tibet border beyond. 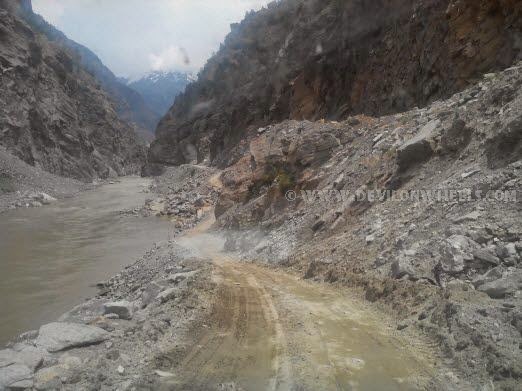 This new alignment of the highway has placed “CHINI” on an ancillary road through “(REKONG PEO)”, “KINNAUR'S” modern-day capital; an ugly, congested township with marvellous views of (JORKANDEN), the highest peak of the “(KINNER KAILASH)” massif. 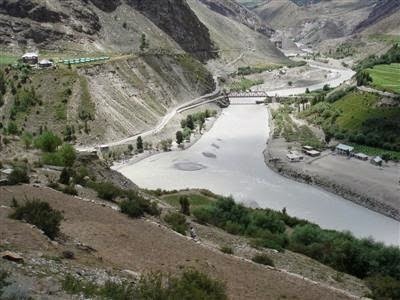 Hydro-electric power projects straddling the (SUTLEJ, NATHPA JHAKRI AND KARCHAM- WANGTU), have changed the character of this once-serene landscape. 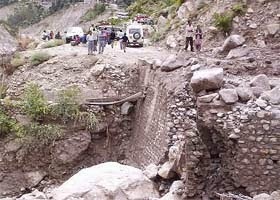 Construction and plying of heavy trucks over the years has resulted in deplorable road conditions. Today even after 150 years apart the road is still a nightmare. Our “HINDUSTAN-TIBET ROAD” adventurous escapade, starts from the well planned city of (CHANDIGARH which was) designed by the Swiss/French Architect “Le Corbusier” and then our route winds through the British Summer capital (SHIMLA), the Land of Himachal Pradesh called as (Devbhumi); the lands of Gods, then drives through the “The abode of the dancing Dragons” (LEH-LADAKH) and then finally passes through the Land of “(GUNS & ROSES)” (KASHMIR). Brief Introduction of the Important “Rivers” those we came across during our expedition. 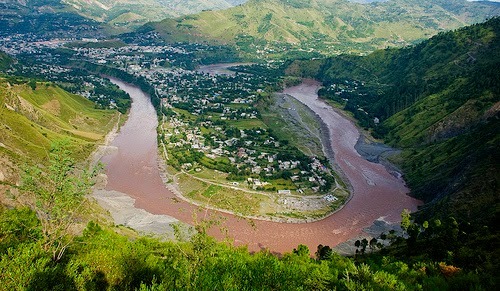 The River “Sutlej” is sometimes known as the “Red River”. 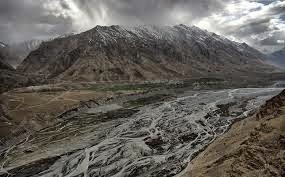 It is the easternmost tributary of the Indus River. 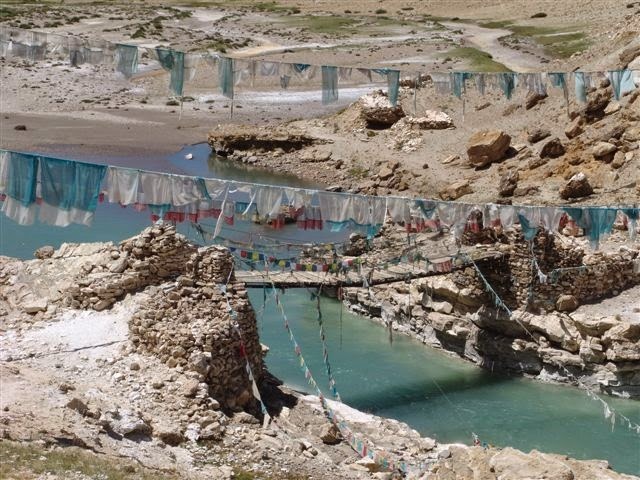 Its source is Lake “Rakshastal” in Tibet. 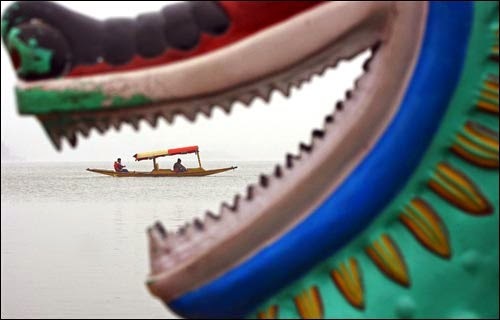 From there, under the Tibetan name “Langqên Zangbo” (Elephant River). 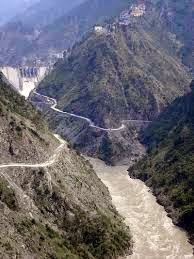 It enters India in Himachal Pradesh state at “Shiki La” pass bordering Tibet It then turns slightly, heading west-southwest for about 360 kilometres to meet the Beas River near Makhu, Firozpur district, Punjab state. It is one of the oldest rivers of Tibet valley. 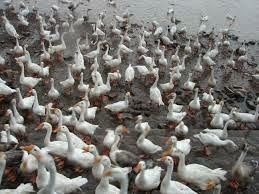 All along our journey from Rampur right upto Chango we travelled by the banks of boisterous ferocious Sutlej river. Spiti River originates from Kunzum Range, which is located at a height of 16,000 ft above sea level. Kabzian and Tegpo streams are the main tributaries of this river. A number of water streams coming out of the eminent Pin valley are also part of this river system. 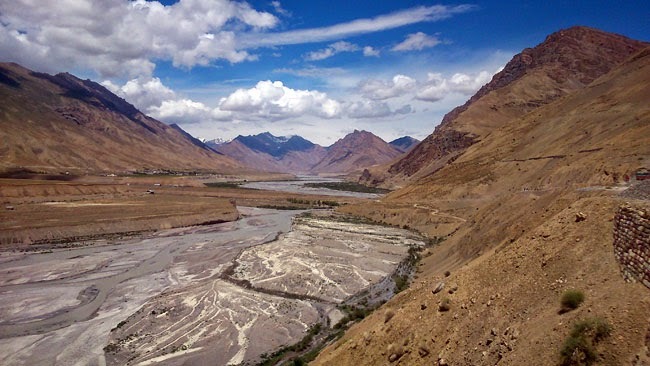 River Spiti gets its waters from the glaciers that melt at the top of the Himalayan range. The river initially flows through Spiti valley and then meets Satluj River in Kannur. 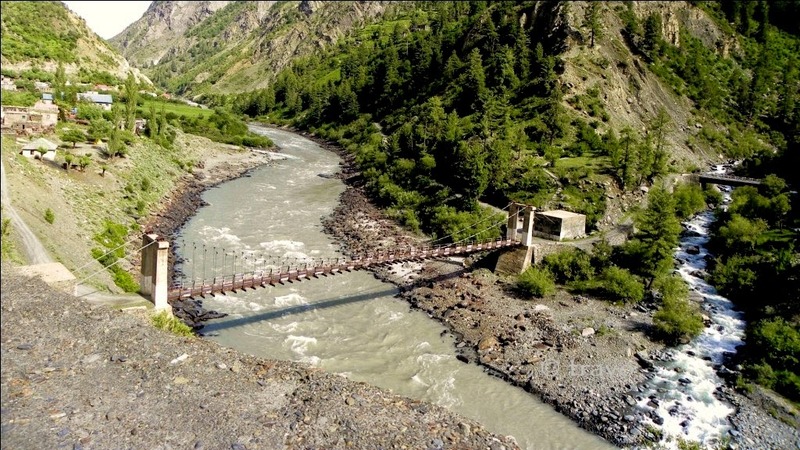 River Chardra originates from Kunzum La glaciers at Chandra Tal and River Baga originated from Suraj Tal Glaciers from Keylong glaciers.These two rivers confluence at “Tandi” near Keylong. 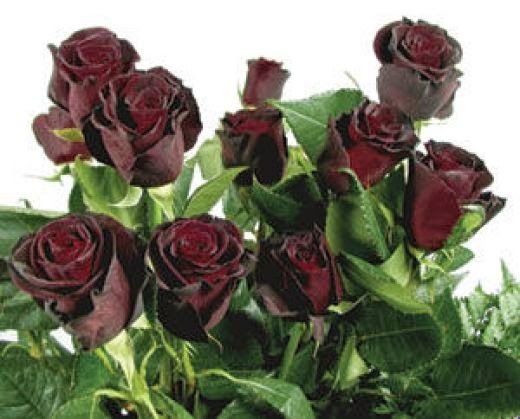 Mythology says that Chandrabhaga is really borne out of love. 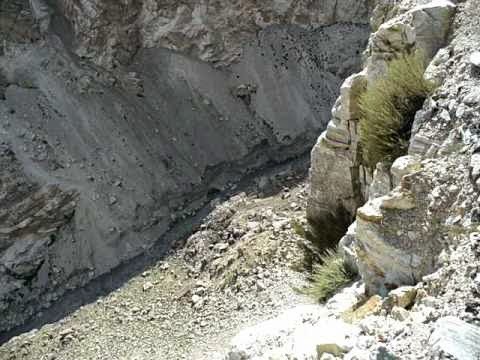 It is said that the daughter of the moon ‘Chandra’ and the son of the Sun ‘Bhaga’ fell in love and decided to take a long walk circumambulation the holy mountains of ‘Lahaul’. After many a meandering course they fell into an eternal embrace in their togetherness at ‘Tandi’ to give rise to river ‘Chandrabhaga’. River Chandrabhaga as it enters Kishtward city, in Jammu and Kashmir state, it confluence with other rivers and then it is called as River Chenab. Because of river Chandra and river Bagha, being lovers river, the banks of ‘Chenab’ are said to have inspired the eternal love stories of ‘Punjab’ namely, ‘Heer-Ranjha’, ‘Sasi-Punnun’, ‘Sohni-Mahiwal’ and ‘Sahiba-Mirza’. Some people even say that the waters of Chenab have a slight reddish tinge brought about by the blood of eternal lovers. As in legend, so in realty, I understand now why ‘Chandrabhaga’ continues to inspire lovers on its banks and around its portals. The river Jhelum rises from a spring at “Verinag” situated at the foot of the “Pir Panja”l mountain ranges in the south-eastern part of the valley of Kashmir. 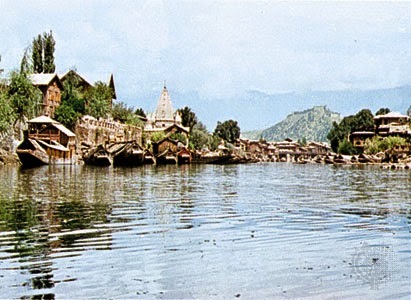 It flows through Srinagar and the “Wular Lake” before entering Pakistan from Kashmir through a deep narrow gorge. The Kishenganga “Neelum River”, the largest tributary of the Jhelum, joins it near Muzaffarabad, as does the next largest, the Kunhar River of the Kaghan valley. 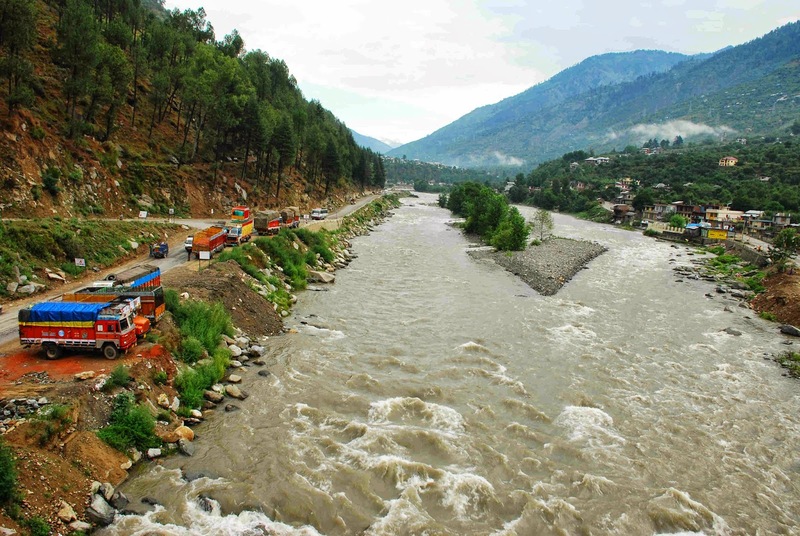 The waters of the Chenab start from snow melt from the Bara Lacha Pass, in Himachal Pradesh. The waters flowing south from the pass are known as the Chandra River and those that flow north are called the Bhaga River. Eventually the Bhaga flows around to the south joining the Chandra at the village of Tandi. 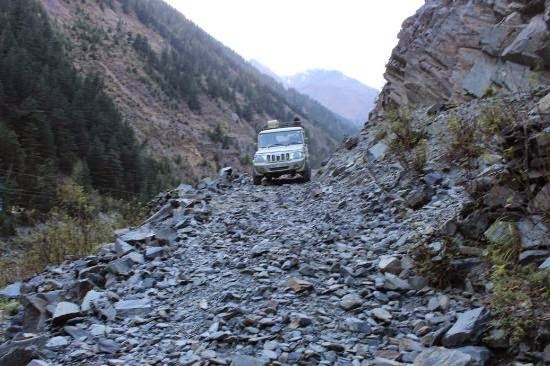 A motorable road runs along the Bhaga River, from Khokhsar to Tandi. The Chandra and Bhaga meet to form the Chandrbhaga River at Tandi. 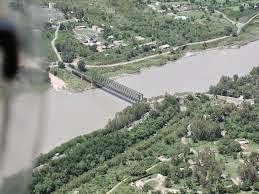 It becomes the Chenab when it joins the Marau River at Bhandera Kot, 12 km from Kistwar Town in Jammu and Kashmir. (1)---NH-22-----(From Chandigarh to Tabo village). Since the narration of our actual travelling route Blog is going to be too lengthy. Hopefully, just to make my Blog more informative and interesting, for my Blog readers, I would be writing this Bog into different Chapters. The length of each Chapter would depend on the length of my narrations of the important events that would have actually experienced while travelling. 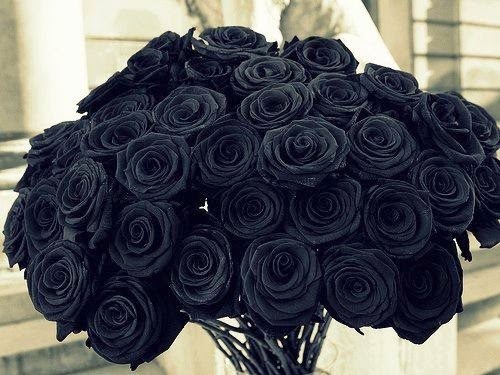 So, my Blog readers please bear with me. 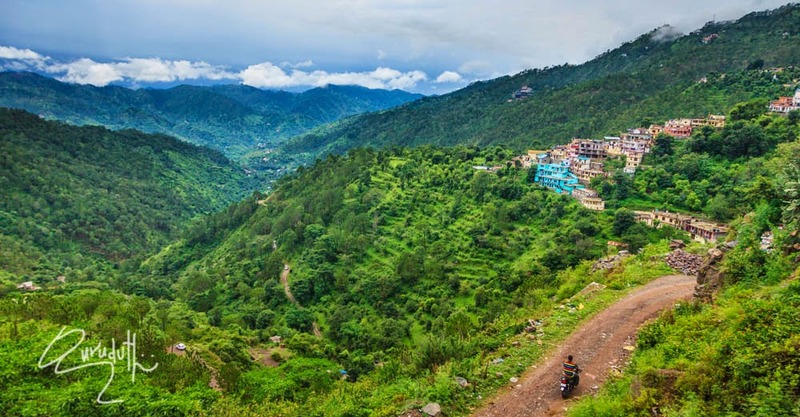 Himachal Pradesh is called as the “Dev Bhumi” the “Land of Gods”.It presents a vivid picture of lush green pastures,excitable rocky ravines, snow clad high altitude mountain peaks, rising majestically in all their grandeur. (Day-1) 16th July-2014 :---Today at 8:30 A.M. “with our safe journey prayers” we started the first leg of our journey. Guruduth was staying at “(Raj Bhavan)” and where as I was staying at “sector-21”. Since both of us were unfamiliar with Chandigarh town and its roads. So we both decided to meet at a conveniently popular land mark that is “TRIBUNE CIRCLE” Mr. Bhatiaji drove Guruduth to “Tribune Circle” where as I came there driving my own small “LILLIPUT” “MARUTI-ALTO” . After greeting each other and loading our “ALTO” with Guruduth’s luggage, we drove down towards Shimla; enroute to our fantasy journey. Since on 14th July, itself Guruduth had reached at Chandigarh (late at night by train from Udupi (Karnaraka)). And on15th July morning, I had not yet reached Chandigarh from Jammu. So on 15th morning, to utilize the day, Guruduth by himself went sightseeing around Chandigarh. After the Partition of India and Pakistan in 1947, the former British province of Punjab was also split between East Punjab in India and West Punjab in Pakistan. The Indian Punjab required a new capital city to replace Lahore, which became part of Pakistan during the partition. 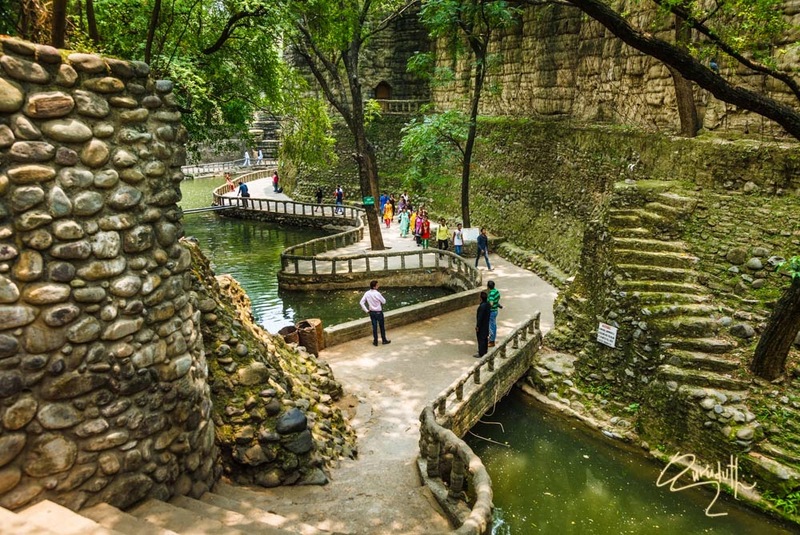 The name Chandigarh, meaning "the Fort of Chandi", is derived from “Chandi Mandir”, an ancient temple devoted to the Hindu Goddess “Chandi”, near the city in Panchkula. 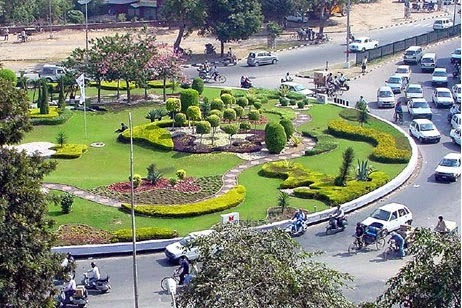 Chandigarh is one of the best-planned city in India. As the capital of the states of Punjab aswell as of Haryana, and is also the Union Territory of Chandigarh, it is a prestigious city. 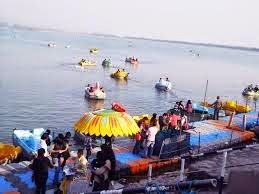 Chandigarh, is the manifestation of a dream that Pt. Jawahar Lal Nehru envisaged. The final master plan of the city was prepared by then the famous Swiss/French architect Le Corbusier , transformed from an earlier plan by the American planner Albert Mayer. Nek Chand was born on15 December 1924 at Barian Kalan, now in Pakistan. He hailed from Shakargarh region (now in Pakistan) of district Gurdaspur. His family moved to Chandigarh in 1947 during the partition. At the time, the city was being redesigned as a modern utopia by the Swiss/French architect Le Corbusier. 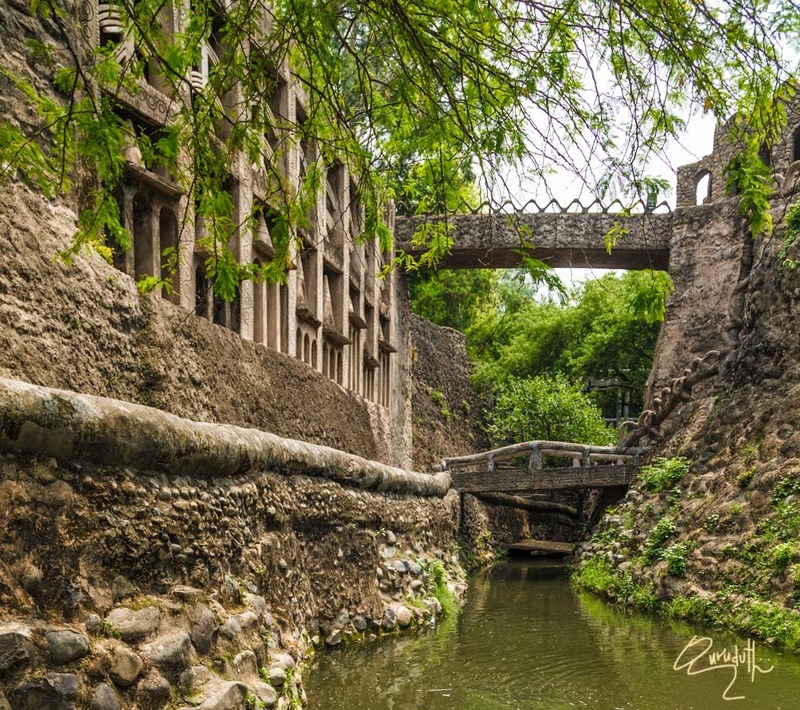 It was to be the first planned city of India, and Nek Chand found work there as a roads inspector for the Public Works Department in 1951. He was awarded the Padma Shri by Governament of India in 1984. In his spare time, Nek Chand began collecting materials from demolition sites around the city. 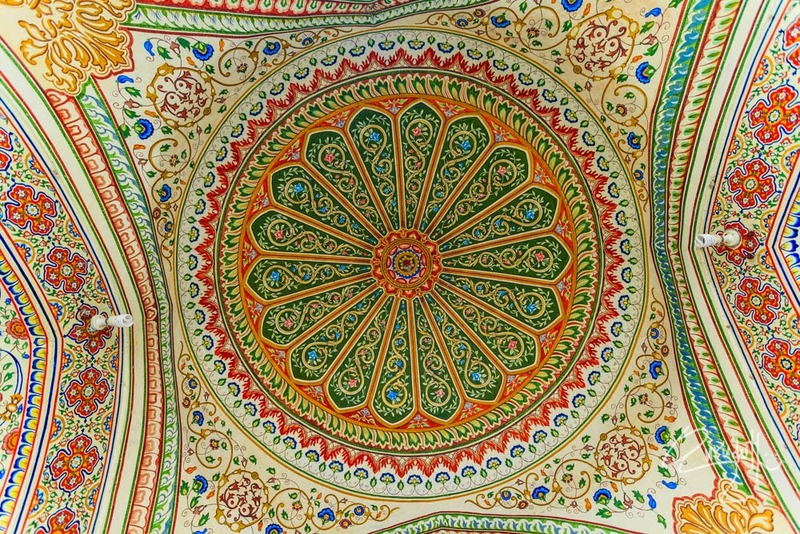 He recycled these materials into his own vision of the divine kingdom of Sukrani, choosing a gorge in a forest near Sukhna Lake for his work. The gorge had been designated as a land conservancy, a forest buffer established in 1902 that nothing could be built on. 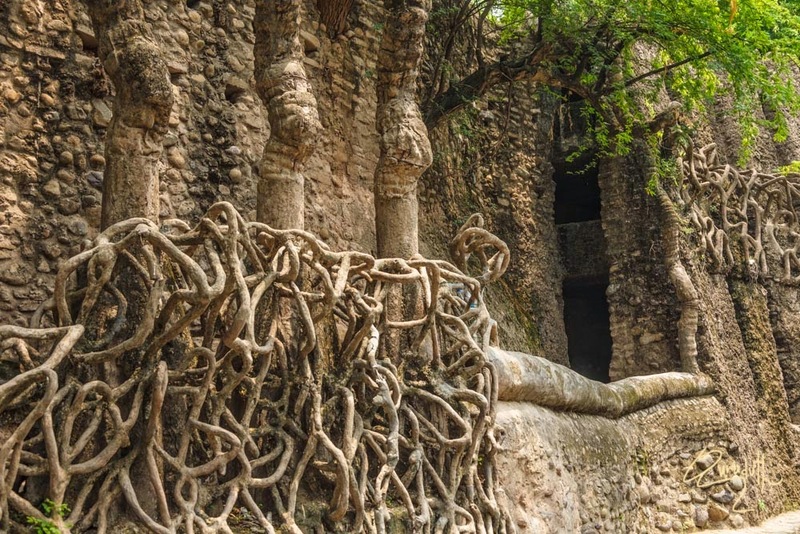 Nek Chand’s work was illegal, but he was able to hide it for eighteen years before it was discovered by the authorities in 1975. By this time, it had grown into a 12-acre complex of interlinked courtyards, each filled with hundreds of pottery-covered concrete sculptures of dancers, musicians, and animals. 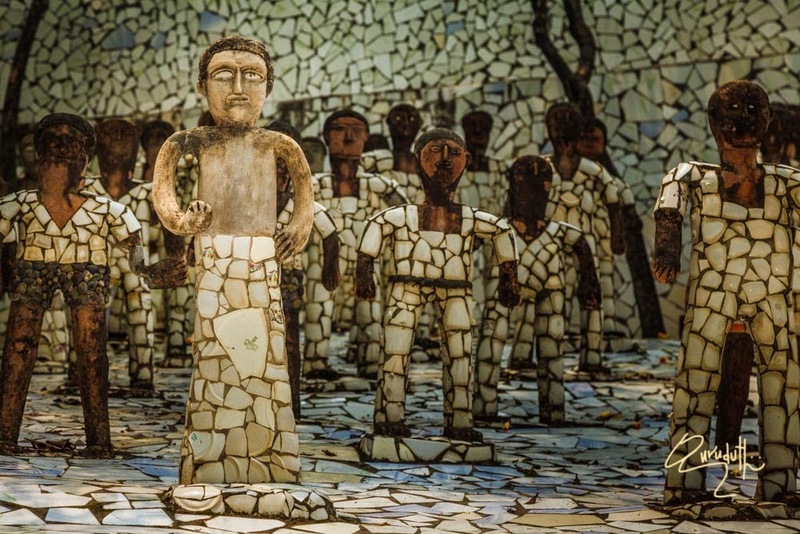 Made from recycled materials, Nek Chand builds up the mass with a cement and sand mix before adding a final coating of smoothly burnished pure cement combined with waste materials such as broken glass, bangles, crockery, mosaic and iron-foundry slag. His work was in serious danger of being demolished, but he was able to get public opinion on his side, and in 1976 the park was inaugurated as a public space. 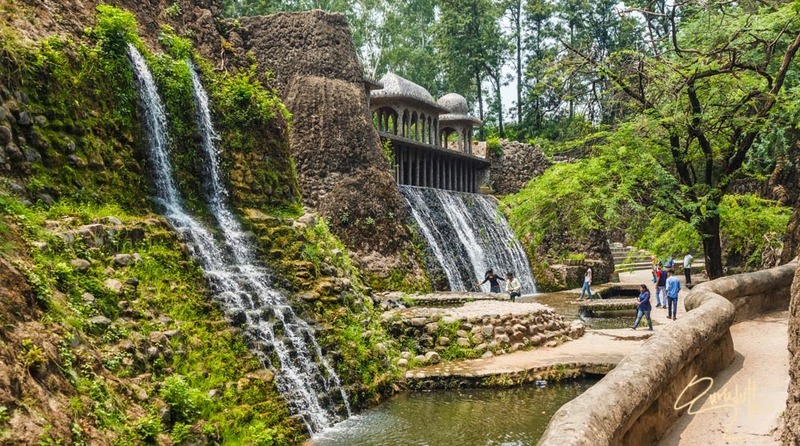 Nek Chand was given a salary, and a title as ("Sub-Divisional Engineer, Rock Garden"), and a workforce of 50 labourers so that he could concentrate full-time on his work. It even appeared on an Indian stamp in 1983. 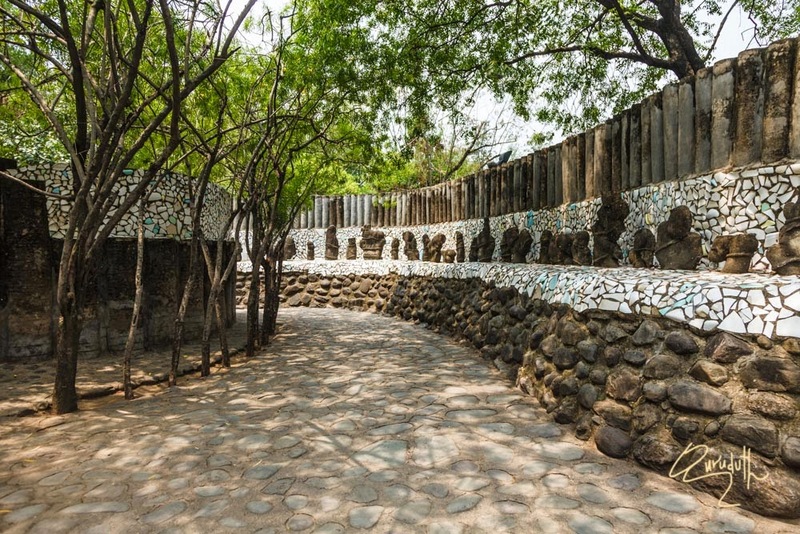 The Rock Garden is still made out of recycled materials; and with the government’s help, Nek Chand was able to set up collection centres around the city for waste, especially rags and broken ceramics. 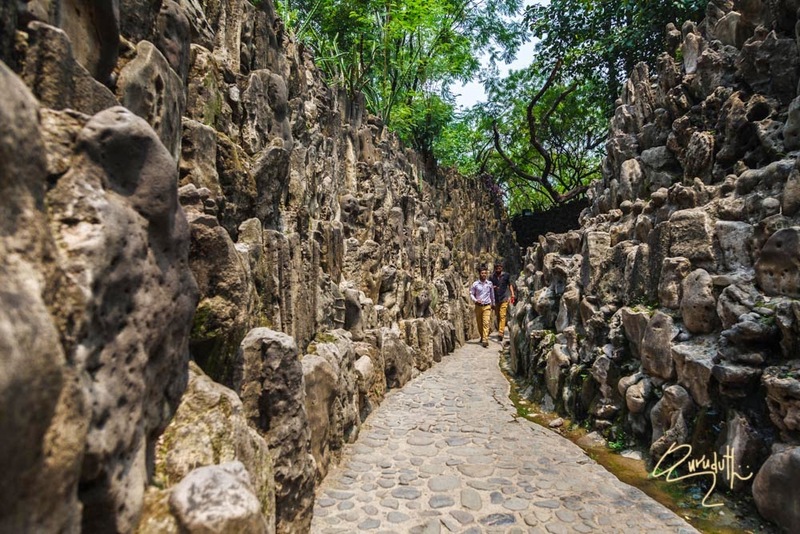 When Nek Chand left the country on a lecture tour in 1996, the city withdrew its funding, and vandals attacked the park. The Rock Garden Society took over the administration and upkeep of this unique visionary environment. The garden is visited by over five thousand people daily, with a total of more than twelve million visitors since its inception. 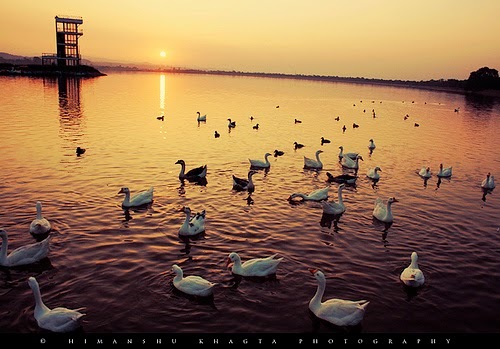 Sukhna is an inseparable part of the city of Chandigarh. Le Corbusier had foreseen that the residents of the city would be drawn it for the 'care of the body and spirit'. The city planners were deeply attached to the lake. So much so that Pierre Jeanneret’s (one of the city planners) ashes were immersed by his niece in the lake in 1970 as per his wishes. 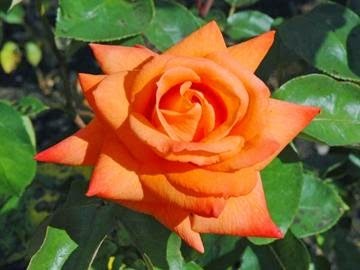 It is a botanical garden located in Chandhigar and spread over 30 acres of land, with 50,000 rose-bushes of 1600 different species. Named after India's former president, Dr. Zakir Hussain and created in 1967 under the guidance of Dr M.S. 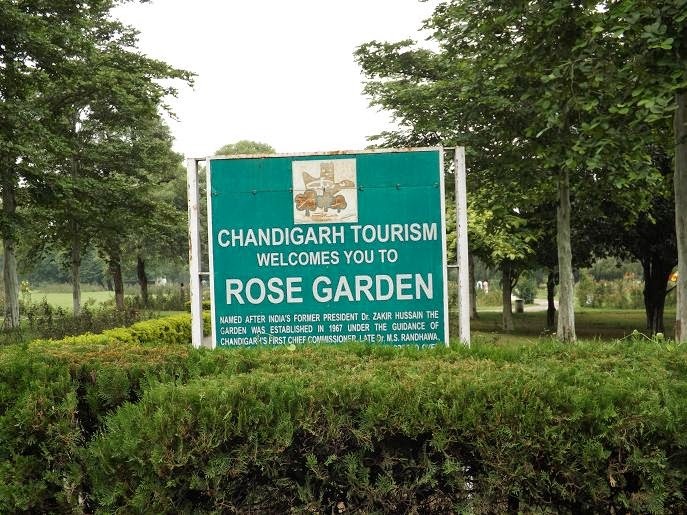 Randhawa, Chandigarh's first chief commissioner, the garden has the distinction of being Asia's largest. 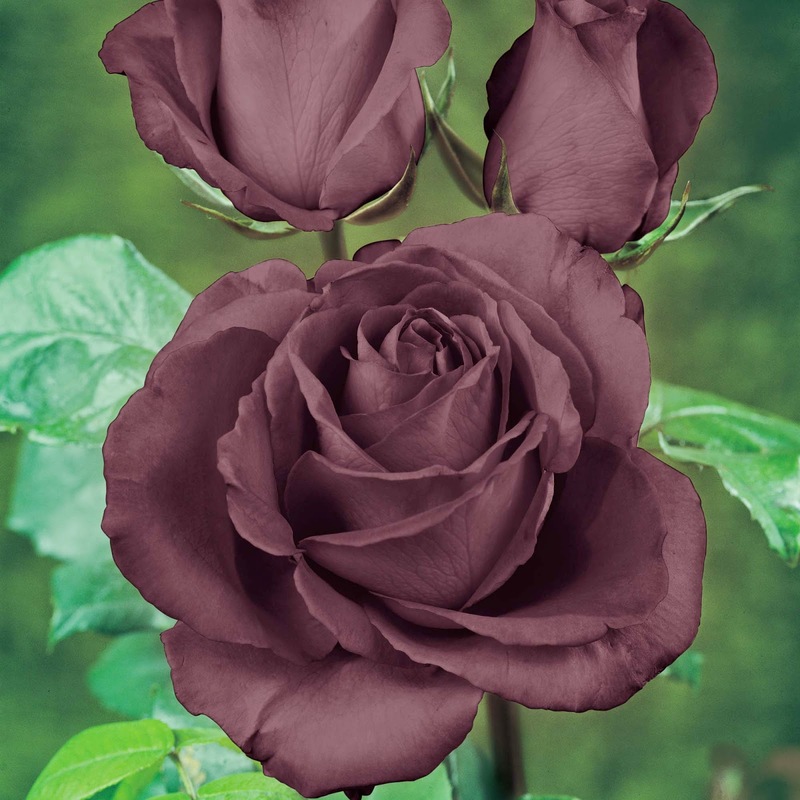 The garden has not only roses, but also trees of medicinal value. Some of the medicinal plants that can be spotted here are bel, bahera, harar, Camphor r and yellow gulmohar. 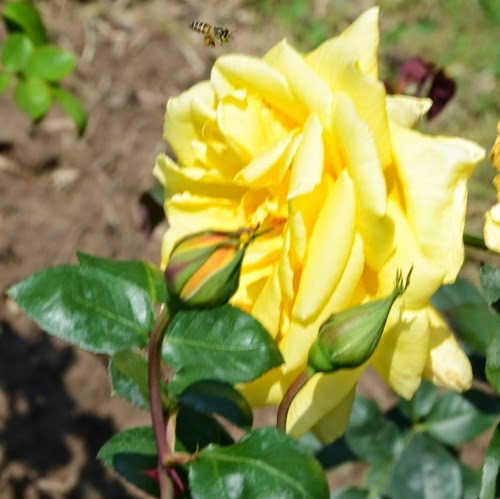 The rose plants have been planted in carved-out lawns and flower beds. 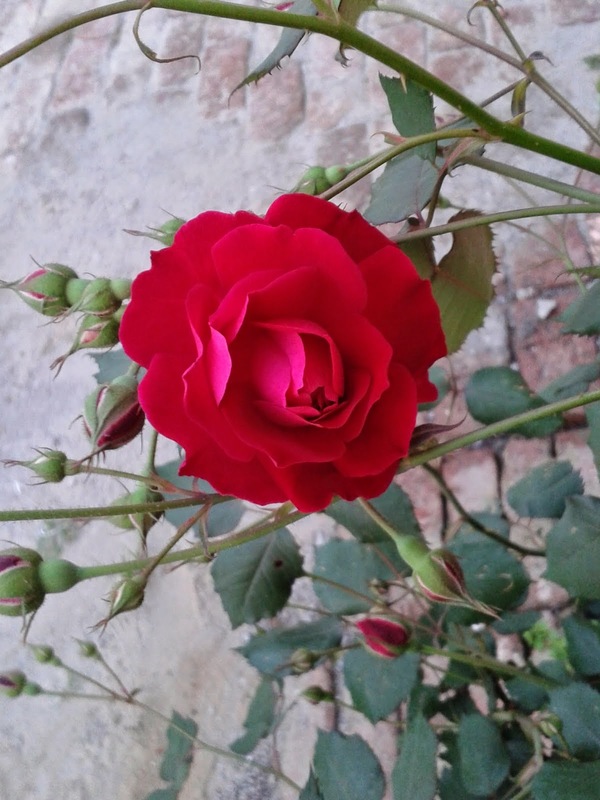 Apart from serving as a host of other events, the Zakir Hussain Rose Garden serves as the venue for hosting the annual Festival of Gardens, a major cultural event of the city during the month of March. 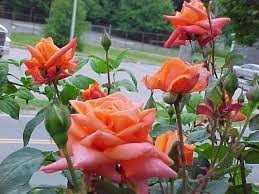 Celebrated mainly as a tribute to the magnificence of the rose itself, the attractions include food, drinks, joyrides, and contests of varying nature, such as photography, gardening, landscaping, bonsai, and Rose Prince and Princess. The contests are open to the residents or institutions from nearby places. After travelling for 12 Km from Chandigarh we reached Panchkulla town. The word Panchkula is derived from the local words panch (five) and kula (canals)" The city of 5 canals", possibly referring to five irrigation canals that distribute water from the “Ghaggar-Hakra River”. The canals take water from the Ghaggar and distribute it from Nada Sahib to Mansa Devi. The canals, build by a ruler in the past are a good example of ancient engineering acumen, as at some spots the water is raised to higher levels than the river course. 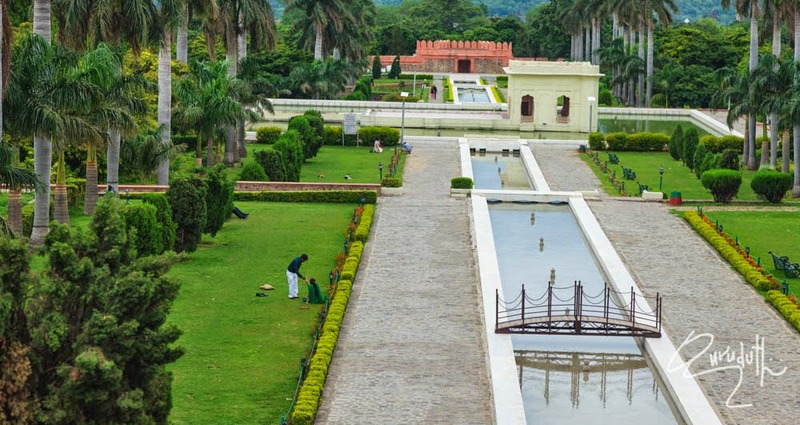 The garden is in the village of Pinjore, Panchkula that lie 22 km from Chandhigar city on the Ambala-Shimla road. It was created in the 17th century by architect Nawab Fidai Khan during the early reign of his foster brother Aurangzeb (1658-1707). 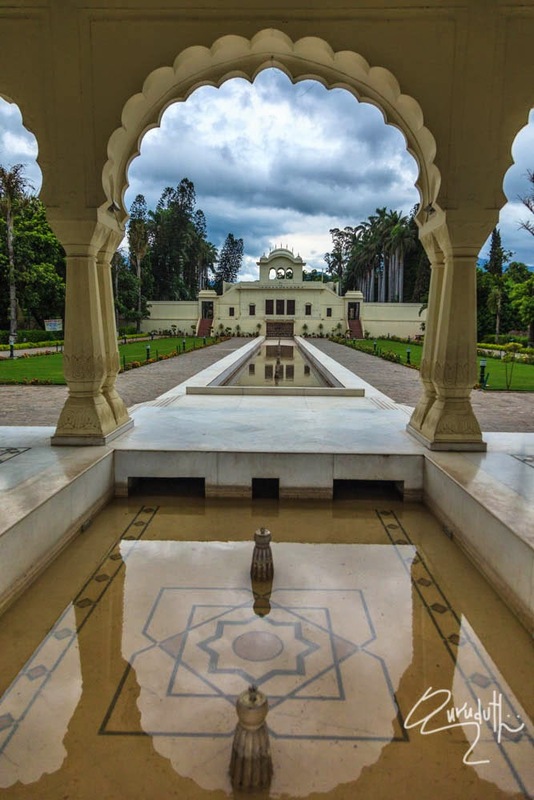 After it was initially built by Fidai Khan, the garden was refurbished by Yadevendra Singh, living Patiala Dynasty Ruler and restored to its former splendour, since it had grown into a wild jungle after initially built due to long years of neglect. 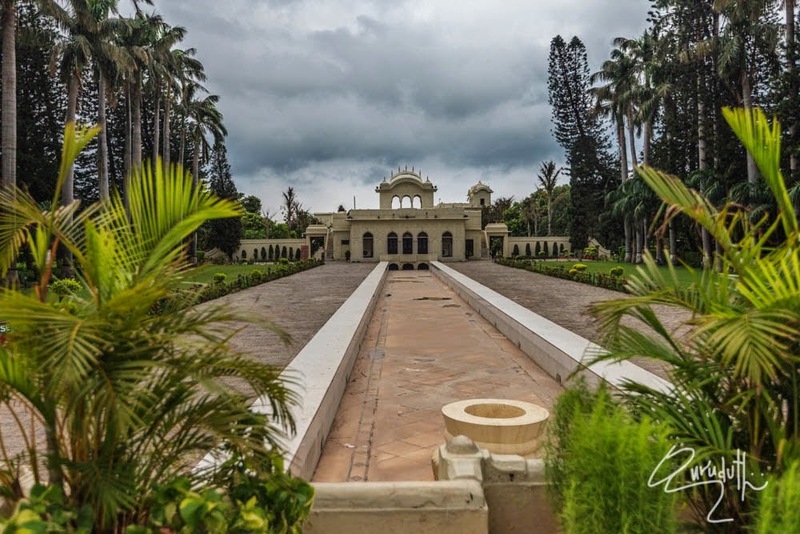 The garden has been laid in seven terraces with the main gate of the garden opening into the highest first terrace which has a palace built in Rajasthani–Mughal style. 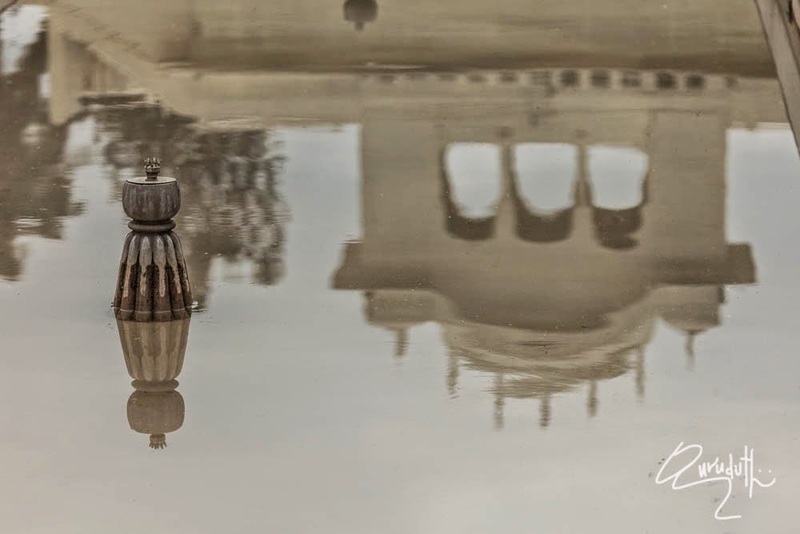 It is called the “Shish-Mahal” (palace of glass), which is adjoined by a romantic “Hawa Mahal” (airy Palace). The second terrace with arched doorways has the “Rang Mahal” (painted palace). The third terrace has cypress trees and flowerbeds leading to dense groves of fruit trees. 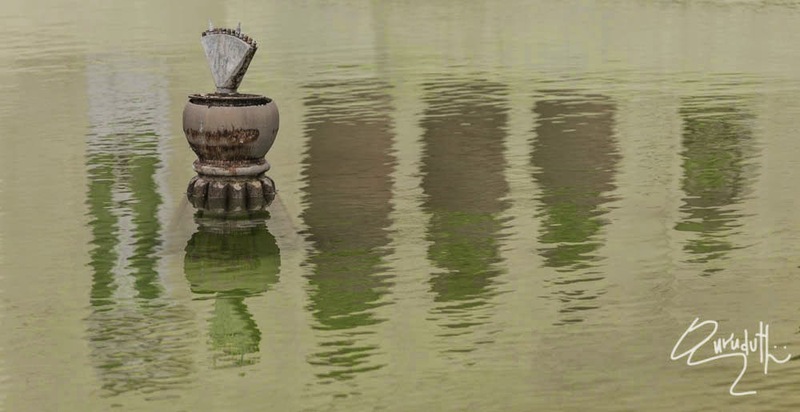 The next terrace has the “Jal Mahal” (palace of water) with a square fountain bed and a platform to relax. Fountains and tree groves are provided in the next terrace. The lowermost terrace has an open-air theatre, which is designed as a disc-like structure. 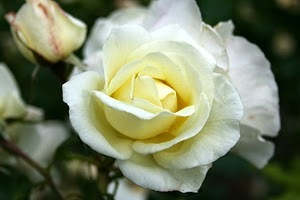 It’s a beautiful garden with serenity, tranquillity and serene atmosphere. While touring one must visit it. After travelling 19 Km from Panchkulla town, we reached Kalka. The road is fabulous and is a pleasure to drive. Old Kalka town is crowded and is the main whole sale business centre which caters almost all the items required by the mountainous people of Shimla region. It is a very hustling and bustling town, though narrow and crowded. 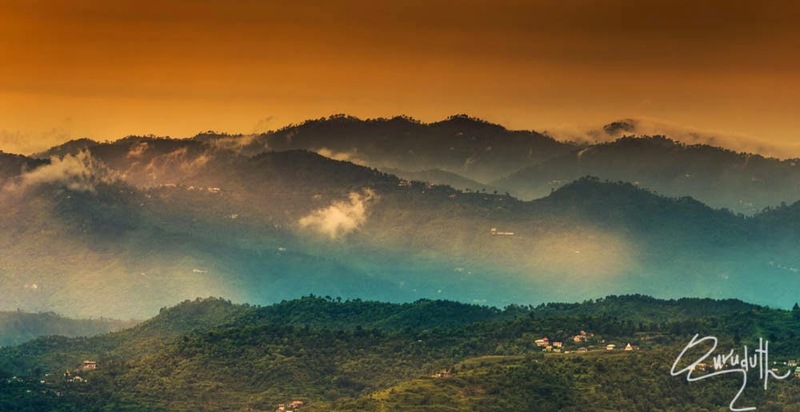 Shimla (then spelt Simla) was settled by the British shortly after the first “Anglo-Gurkha War”, and is located at 7,116 feet (2,169 m) in the foothills of the Himalayas . By the 1830s, Shimla had already developed as a major base for the British. It became the summer capital of British India in 1864, and was also the headquarters of the British army in India. Prior to construction of the railway, communication with the outside world was via village cart. The Kalka–Shimla Railway was constructed on 2 feet narrow gauge tracks by the Delhi-Ambala-Kalka Railway Company commencing in 1898.The estimated cost was Rs 86,78,500, however, the cost doubled during execution of the project. The 96.54 km (59.99 mi) line was opened for traffic November 9, 1903. 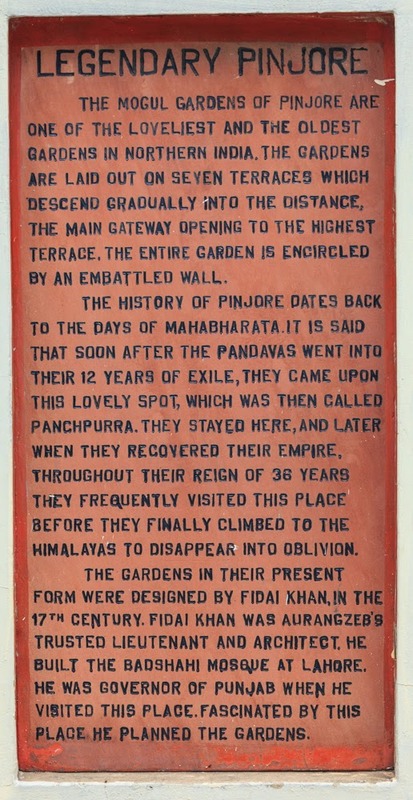 It was inaugurated by Lord Curzon, then Viceroy of India. Because of the high capital and maintenance costs, coupled with peculiar working conditions, the Kalka–Shimla Railway was allowed to charge fares that were higher than the prevailing tariffs on other lines. 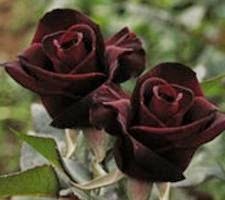 However, even this was not good enough to sustain the company, so the Government had to purchase it on January 1, 1906 for Rs 1,71,07,748. In 1905 the line was regauged to 2 ft 6 in (762 mm) gauge under guidelines from the Indian War Department seeking to ensure uniformity in all imperial narrow gauge systems. For about a week starting on September 11, 2007, an expert team from UNESCO visited the railway to review and inspect it for possible selection as a Wolrd Heritage Site. 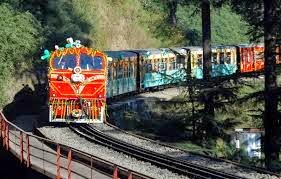 On July 8, 2008, the Kalka–Shimla Railway was included in the UNESCO World Heritage List as part of the World Heritage Site Mountain Railways of India. 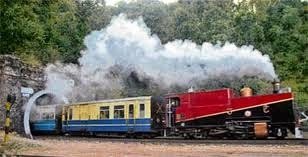 The Mountain Railways of India including Darjeeling Himalyan Railway, Nilgiri Mountain Railway and Chhatrapati Shivaji Terminal in Mumbai had already been declared as world heritage properties. 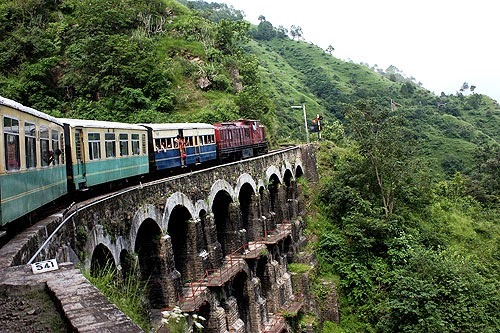 Originally 107 tunnels were built on Kalka Shimla Railway Track. In 1930 they were renumbered and four of them were discarded so only 103 were left. In 2006 tunnel number 46 was dismantled so presently only 102 are in use. 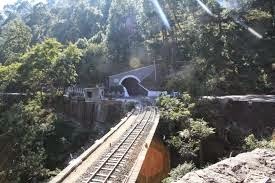 But tunnel number 103, the last tunnel in Shimla, is still famous as tunnel number 103 as this place has become a famous landmark of the town. The line has 864 bridges, one of which is an 18.29 metre (60 ft) plate girder span and steel truss. The others are viaducts with multi-arched galleries like the ancient Roman aqueducts. Bridge No. 493, historically known as the "Arch Gallery", situated between Kandaghat and Kanoh stations, is an arch bridge in three stages, constructed with stone masonry. Bridge No. 226; between Sonwara and Dharampur is an arch gallery bridge having 5 tier galleries of multiple spans, constructed with stone masonry and bridging a deep valley surrounded by high peaks. The railway has 919 curves, the sharpest being 48 degrees (a radius of 37.47 m or 122.93 feet). 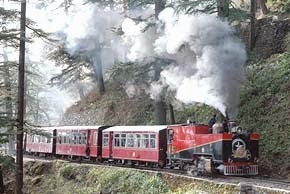 Climbing from 656 meters (2,152 ft), the line terminates at an elevation of 2,076 meters (6,811 ft) at Shimla. After travelling for about another 25 Km from Kalka, we reached Kasauli via Parwanoo and Rampur. Immediately after Kalka, come a small village called “Jabli”. At Jabli village there is a beautifully ethnically designed looking huge rectangular structure which reads “Land of Devbhoomi Welcomes You” From there Himacha Pradesh state starts. To go to Kasuali we had to drive through Dharampur town. To go to Kasuali, here we had to take a left diversion which leads to Kasuali via Gadkhal (7 Km). Gadkhal a small village with very narrow road. Kasuali is about 10 Km from Dharampur. To enter Kasuali hamlet, at the entrance of the Kasuali hamlet itself, we had to pay vehicle entry ticket of Rs- 50/- and none of public vehicles are allowed beyond certain restricted area zone. The parking area is manned by the Army. To explore places of tourist, everyone has to walk on foot. All around Kasauli it is a very steep climb and nearly all of us pantingly gasp while climbing around. 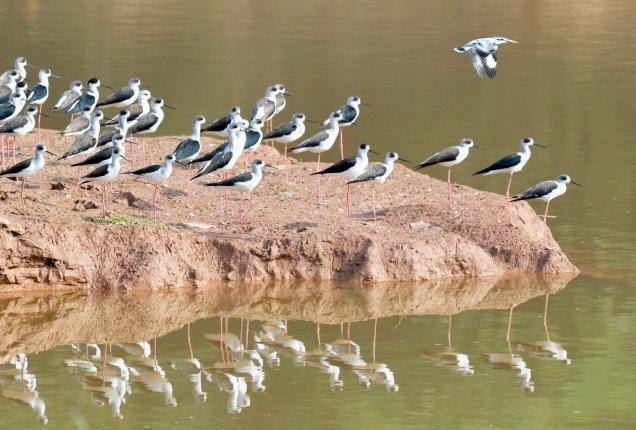 Kasuali is a hill station developed by the British in 1845 and now has a army cantonment. Alcohol is not allowed in this cantonment areas and photography of these areas with Army buildings are strictly prohibited. Only anyone can click natural scenic places posing in front of these natures natural creations. This small hill station seems to live in time warp that belongs to the 19th century. 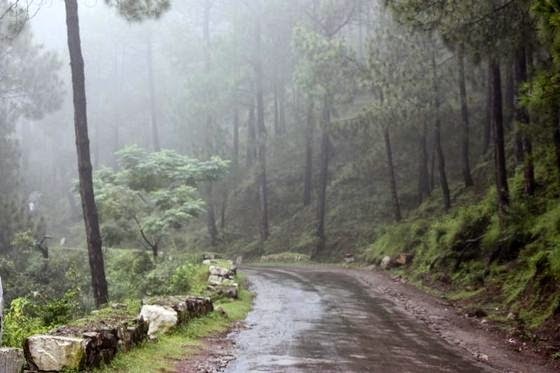 The narrow roads of Kasauli slither up and down the hillside and offer some magnificent vistas. Directly below is the spread of vast plains of Punjab and Haryana which as darkness falls, unroll a gorgeous carpet of twinkling lights. 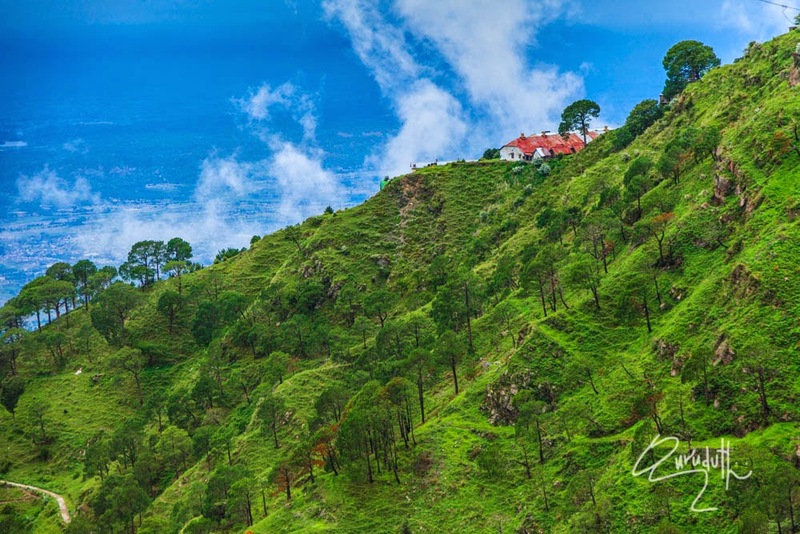 At (8,315 feet) above MSL, the peak of Choor Chandni also called the Choordhar, powerfully dominates the lower hills and across the undulating ranges, the “Chail” as well as the city of “Shimla” are visible. 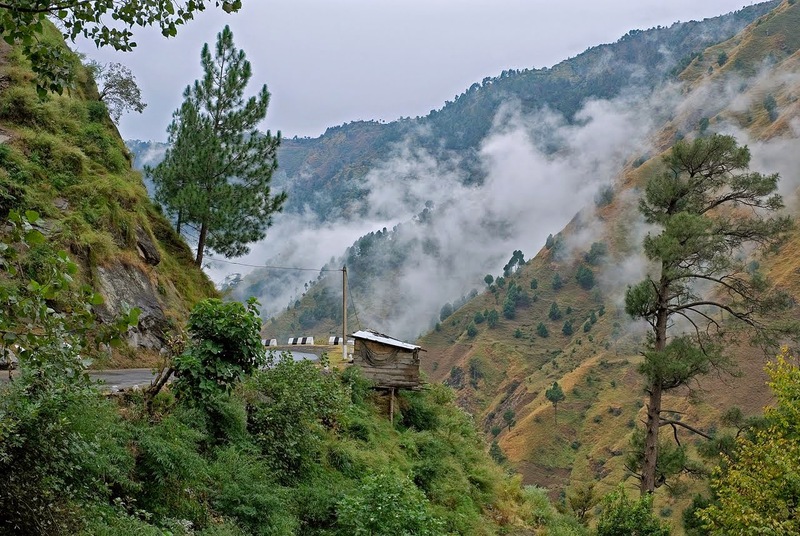 The upper and lower malls run through Kasauli's length and one can enjoy longs walks. A mixed forest of pine, oak and huge horse-chestnut encircles the town. 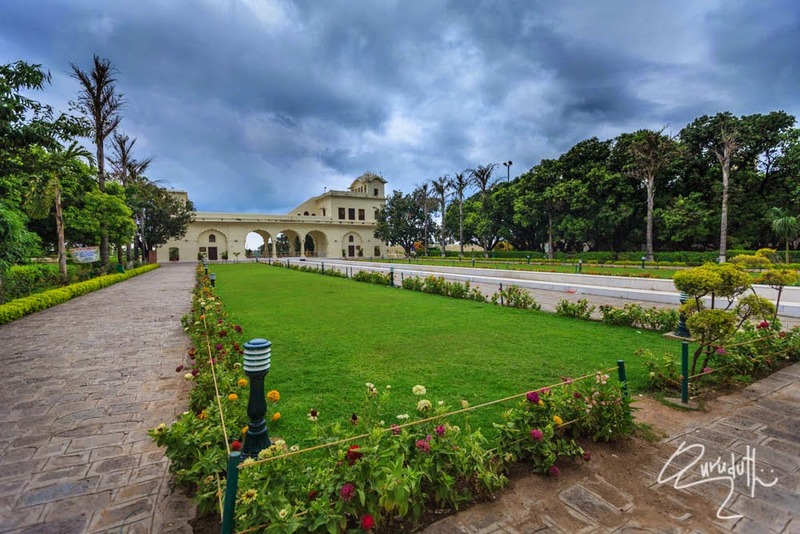 Its colonial ambience is reinforced by stretch of cobbled road, quaint shops, gabled houses with charming facades and scores of neat little gardens and orchards. MONKEY POINT :--- 3.5 km from Hotel Ros Common, a hill which derives its name from Rishi Man-Ki who used to worship an idol of Lord Hanuman and later the summit was crowned with a small temple dedicated to Lord Hanuman and presently being looked after by the personnel of Air Force, stationed here. The area being restricted from security point of view, no belongings like Camera etc are allowed. OTHER ATTRACTIONS:--- Christ and the Baptist Church are examples of Kasauli's colonial architecture. Central Research Institute established in 1906 by Dr. Sample prepares various vaccines. Kuthar (46 km) has an old palace with wall paintings. The small Sanwara Station (16 km) on the Kalka Shimla Railway line can make a good downhill hike from Kasauli. BABA BALAK NATH TEMPLE:--- 3 km on the Hill top is a famous temple of Sidh Baba Balak Nath. SHIRDI SAI BABA MANDIR:--- Built in 1989 the famous temple is located half a km away from Gadkhal. The idol of Sai Baba was built at Jaipur and the burning flame in this temple signifies the divine power of “Sai Baba of Shirdi”. LAWRENCE SCHOOL:--- Situated on top of the hill is the famous Lawrence School. Mr. Henry Lawrence was the founder of this school. He also built the first cottage in Kasauli known as Sunny Side in 1848. After walking around Kasuali, we were tired and Hungary. So we drove down back to Dharampur to have lunch at “GyanSingh Dhaba”. Dharampur. Seems to be a small time stop over just for tourists to have either lunch or tiffin or dinner. On either side of the road, there are many eating joints. At Dharampur, at a small road side auto-electric-mechanic shop, we got our car’s cigarette lighter socket mended, so that while travelling we could use our USB socket to charge our mobiles handsets. We noticed one thing that almost all people around Himalayan road sides are very innovative and are experts in doing “Jugaad” (setting breakdowns temporarily right) mechanism. And mind you in crises these “Jugaads” work excellent. From Kasauli to Solan town is another 30 Km. It’s one of Himachal Pradesh’s Industrial hub and educational centre. SOLAN :--- Located on the National Highway - 22 Solan derives its name from "Shoolini Devi" a local deity whose temple is situated in Solan Graon which is in existence since ancient times. Solan also remained capital of erstwhile Bhagat State for many years. A famous "Shoolini Fair" is commemorated every year in 2nd week of June at Thoda Ground. The town has various cultural and recreational centers besides temples and churches. 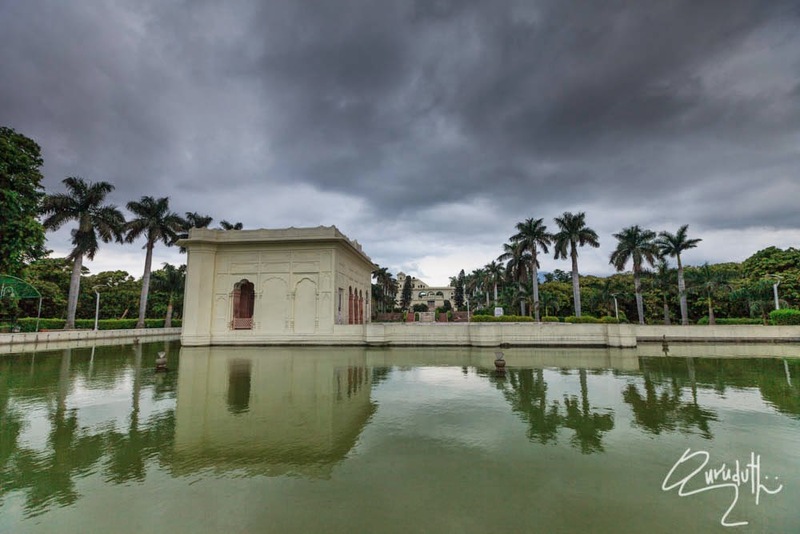 There are beautiful parks such as Children Park, Mohan Park and Jawahar Park which have adequate arrangements for comfortable sitting and strolling. A mini zoo in the park adds to the fascination of the environment. Durga Club, Central State Library, Lower and Upper Bazaar and Mall road are worth visiting. Ancient Durga Temple, Sanatan Dharm Mandir, Hari and Narsingh Mandir are also quite famous. SOLAN BREWERY:--- (11 km) : This is in existence since 1855 AD. Formerly Dyer Meakin Brewary, it is not only known in the country but also in foreign countries for its products. JATOLI:--- (15 km) : 7 km from Solan this small but beautiful village on Solan - Rajgarh road famous for Vishal Shiva temple. DOLANJI BON MONASTERY:--- (18 km) : On Solan - Rajgarh road there is a small village known as Ochhghat. 5km from here on Narag-Sarahan road, located at famous Bon Monastery known 'Yungdrung Bon Monastery' being run by Yungdrung Bon Monastic Centre. This was founded in 1969 by the Abbot Lungtog Tenpai Nyima. After 14 years of hard work, he managed to create a totally self sufficient monastery with 120 monks, developing it into a thriving, active centre of all branches of Tibetan traditional learning. On the eve of New Year and on other occasions three sacred Bon dances are performed here which are of great attraction. KAROL GOOFA:--- (17 km) : On the Karol Tibba (2135m) and 8 km from Solan town is an ancient Sidh Goofa which is considered to be one of the longest Goofa in Himalayan region. It starts from Karol and ends somewhere at Pinjore. Besides Goddess Kali and Lord Hanuman temples, Thakur Mandir on top of the hill are some the great attractions for the pilgrims and visitors. 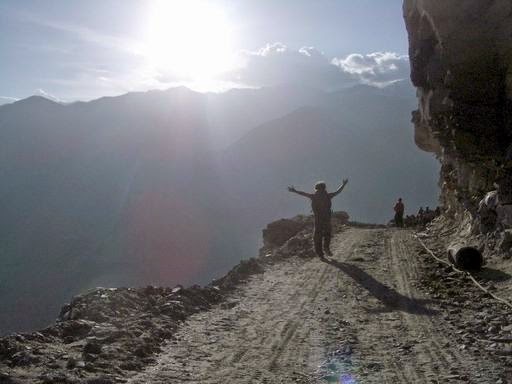 The trek up to Karol is steep but quite enjoyable. This place is very popular amongst the trekkers and adventurous picnickers.